After the group meeting in which re-election of leaders was undertaken as a group we moved forward to discuss research, as this would be a fundamental factor of us getting our understanding of our time period correct we had to step it up. To do this whilst we wasnt 3d modelling as of yet the group was split into 2 research and concept so we had more researchers. The idea was to get reference images up on the map that i had given a key to the previous week. This gave the concept team a better visual of the street from just looking at the wall rather from memory, especially for the blocking point we are implementing so they could design some form of realistic blocking. After adressing research the facebook group i set up was addressed and its purpose. The group is there while we wait for base camp a more professional project website we can upload work onto. But for now facebook can be used to alert the group to any links, images, feedback, adsence etc. Its there as a temporary use but still helpful. As previously discussed in the last session Ye old white harte is a possible side client for this project, myself and phil went to go and have a meeting with the owner. Unfortunately he was called to an emergency meeting and it will have to be rearranged for another time but the interest seems to be very clear. My personal reflections for this session is despite the change of leader feeling it was unessacery myself we still moved on well as a group like a seemless change. 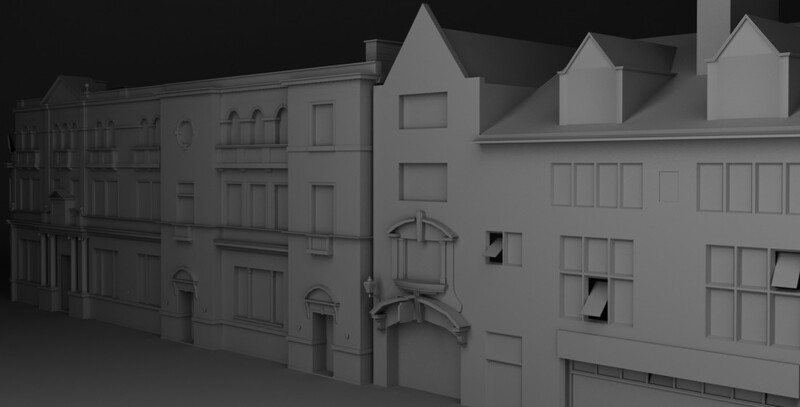 Being a 3d focused person at the moment i thought that going into the concept team would add myself an extra challenge to push myself and photoshop is something im ok at but not highly skilled, so the change of work will be a good test and will improve my overall skillset. Next week i believe we are going out with a student stood up against each building for an idea of scale as the space inside the game needs to feel real and accurate. Categories: Client Project, Year 2 | Tags: Client, Project, research, Ye old white harte | Permalink.